There are many different companies manufacturing fuel filters for the PowerStroke engine. Unfortunatly, many of these are poorly designed. The most common replacement has a wire bail at the top to help removal of the filter from the housing. There has been three problems with most of the aftermarket filters fuel filters. The first is the o-ring seal for the filter housing lid. The original o-ring is bevel-cut, and many replacement filter come with a square-cut o-ring. If the o-ring is not thick enough, then the lid may leak fuel. If it is too thick, the the check valve in the stand pipe on which the filter installs will not be fully opened. The second problem cannot be easily detected. Inside the filter at the top plate is a protrusion. This is ment to open the check valve at the top of the filter stand pipe. If this protrusion is not long enough, then fuel flow to the injectors will be reduced, resulting in decreased power or economy. Finally, at the bottom of the fuel flter is a seal which prevents fuel from by-passing the filter around the stand pipe. Many of these seals are thin and tend to split where the pass through the bottom filter plate. 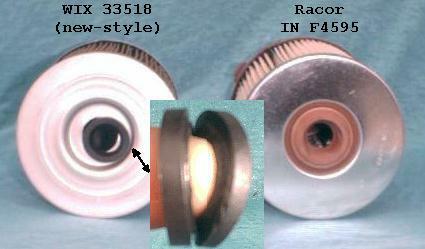 Sometimes the seal will split completely around and the lower half may be overlooked during filter replacement, resulting in the new filter not seating fully into the housing. 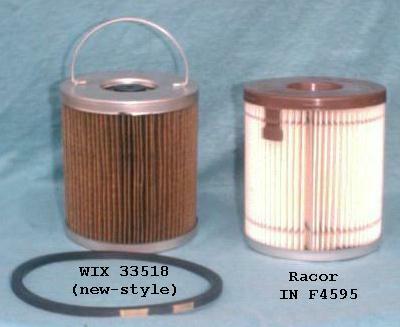 I am recommending using only the Racor fuel filters (they manufacture the PowerStroke fuel and air filters for Motorcraft), at least in the 94-97 PowerStroke engines. If you have to use an aftermarket filter, inspect it before you by it. I have seen these problems with the Baldwin, Hastings and the new design WIX replacement fuel filters for the 94-97 PowerStroke.